The Funky Felter: The Bubbles Collection - fun, summer jewelry! The Bubbles Collection - fun, summer jewelry! 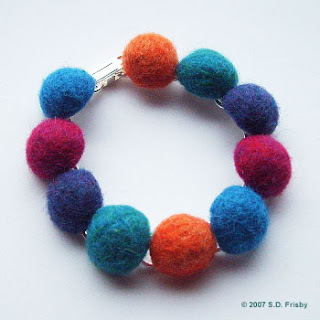 With a little imagination and some of my woolly beads, I created some very bubbly jewelry with bright summer colors! No, wool in NOT just for winter weather. Jewelry can be worn any time of year, especially when it is as bright and cheery as this jewelry is. With less time lately to make larger felt pieces due to the duties of my job as a teacher, I have been expanding on the possibilities of what to do. Well, I came up with this fun, simple jewelry that I call "The Bubbles Collection" because each little brightly colored bead reminded me of a little bubble. Also I feel the rings and bracelets are very appropriate for Spring and Summer wardrobes. While I plan to make some wonderful, woolly scarves this summer to sale in the Fall and Winter months, I know that light, bright woolly items are more appropriate for Spring and Summer wear. I also think that it is super appealing to the young at heart. I really do not aim to design for kids and young adults, but I guess that some of my bright colors and simple styles express that. Truly, I think that anyone can wear my pieces. They are for the young at heart with a flair for stylish fiber art!